Since moving into our new house, we decided to disconnect cable and go to strictly Internet-only content. We have been cable free for 4 months now and it has been a pretty easy transition. To replace cable initially our setup was a HDTV Indoor / Outdoor Antenna and a Apple TV with subscription services to Netflix & Hulu. The biggest complaint I had about the antenna was not knowing what content was playing on the channels provided as well as always having to scan for new channels due to how the antenna is currently positioned (I plan on running a antenna to my roof probably in the spring). After some research, I came across Boxee TV as a solution. Even though this product is in its infancy, I am really pleased so far on having a clean interface for antenna based television. Another great feature of this product is the option of watching live TV on the go for no extra fees. 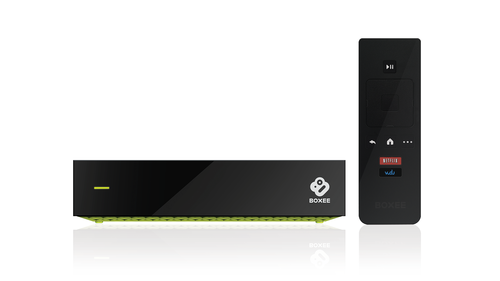 The Boxee TV provides a free web application that can be used on any device. This is nice for watching sporting events and local news on the go without downloading any extra applications. The DVR functionality is seamless, but I will probably not pay the $10 per month after my free three month subscription ends. As for the applications, Boxee TV needs to add more content which the Roku provides by default such as Amazon Video On-Demand and HBO GO. I understand that the Boxee TV was just released, so I will be patient on the supported applications. For all streaming subscriptions, we will be using Apple TV just because the applications are more polished. Due to how "Apple-centric" my house is, I am able to use Airplay Mirroring for all other content online. So I can be patient with Boxee TV in the meantime. So if anyone wants to ditch cable, this $99 product is worth the investment. The Boxee TV is a great set-top box that provides everything for people looking to ditch cable; even if you do have cable, you can still use the Boxee TV as a Live TV + no limits DVR set-top box. I applaud Boxee Incorporated for providing consumers an alternative to cable television and trying to battle the cable companies. Boxee's battle is going to be fierce and I am happy to buy their products even if some basic applications are missing during initial release. I feel very passionate about giving the consumer multiple options and currently living in a city that is dominated by Xfinity/Comcast, I like having an alternative to traditional cable. Boxee TV is being sold at Walmart, so you can check it out prior to ordering online.